Vancouver audiences have been used to consistently fine performances from this great ensemble over the past 30 years, but this year’s visit produced something very special. Part of this was the mix of works played but what was really remarkable was the way in which the Takacs succeeded in bringing out the individual greatness of all of these works. For the Haydn and Brahms quartets, we are dealing with undisputed masters in the area. The Takacs already have splendid recordings of both composers on Decca from the 1990’s and have followed these with more recent recordings for Hyperion. They have also started on the string quartets of Benjamin Britten, and their performance of his final string quartet was an occasion for us. If one ever required a reason to justify Franz Joseph Haydn as one of the greatest composers of them all, one need look no further than his Op. 76 cycle of six string quartets. 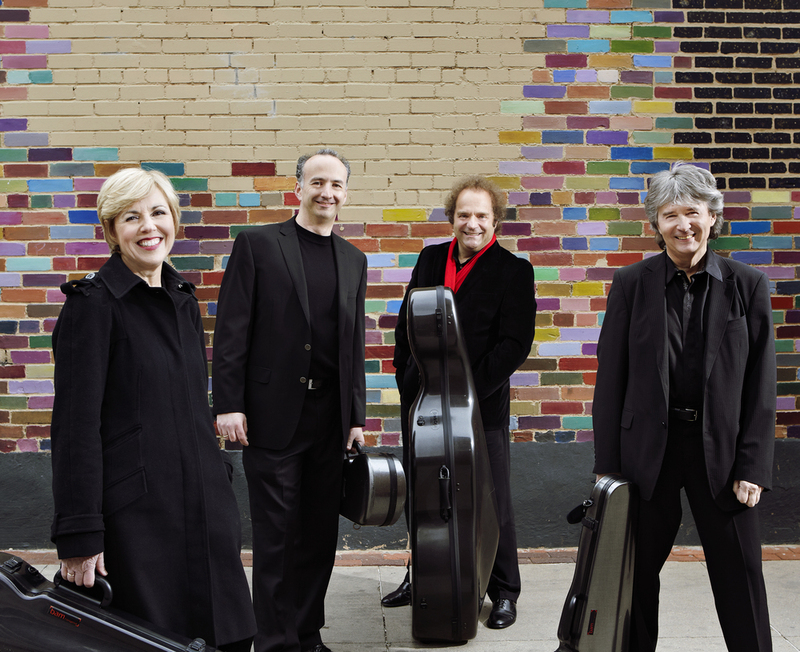 Their variety, depth and imagination give these ‘late’ quartets something of the same status as those by Beethoven. While the ‘Emperor’ (No. 4) is the most popular, all are remarkable experiences. The fifth, performed here, starts from a genteel, almost innocent, theme in its opening movement but so skillfully introduces musical energy that when the frenetic, almost manic, downward scales eventually burst out repeatedly from all strings, one can hardly believe that Haydn could take on such a journey. The second movement is very beautiful but once again we are taken into a strange and mysterious world when the low, exposed cello notes suddenly appear, suspending feelings in a way that later composers such as Schubert would have envied. The staccato-based finale is a construction of sheer mastery; full of wit and very exciting. I cannot think of a finer performance than the one that the Takacs gave, fully sensitive to the work’s originality. All three Brahms quartets are masterpieces. They have great structural strength, though the second (played here) is probably the most lyrical, always having a wistful melancholy intertwined with its more driving and impassioned statements. Some ensembles emphasize the work’s lyrical feeling; others, its dramatic weight. The Takacs definitely found the golden mean here, integrating both dimensions with exceptional balance and insight. Especially in the first and last movements, the ensemble’s control produced quite riveting concentration and momentum as these movements moved towards their close. This was not ‘big’ romantic Brahms; more a finely-detailed, integrated reading, fresh, engaging and full of motion. The middle movements were perfectly contrasted and in scale. Modern British composers have always loved the sea and Benjamin Britten is no exception. His teacher, Frank Bridge, in fact wrote a beautiful symphonic work entitled simply ‘The Sea’ (1911). Britten’s most well-known contribution is the atmospheric ‘Four Sea Interludes’ from the opera Peter Grimes (1945), set on the tumultuous North Sea. However, as leader, Edward Dusinberre, emphasized in his lucid discussion of Britten’s String Quartet No. 3, another city of water, Venice, dominated Britten’s final days, producing both the opera, ‘Death in Venice’ (1973) and this last quartet (1975), written while he was in a wheelchair. The Takacs gave a most committed performance of the third quartet, taking us convincingly all the way from the angular, rocking motion of the water in the first movement to the final tender phrases of the last, interestingly punctuated by a final note in a different key. The work is pure Britten, more astringent and abstract than earlier works but always aware of the delights of musical construction, sometimes taking us to an ethereal world where deep emotions are glimpsed but remain elusive. In the past, the Takacs have given us fine Britten but there I still felt that the projection of some phrases and rhythms were not free of a Central European accent. (This was also true in the Pavel Haas Quartet’s treatment of String Quartet No. 2 this fall.) In this concert, I think the Takacs Quartet really got it right, capturing Britten’s special and enigmatic world very exactly and bringing out the full glory of his last inspiration.